Math with rats at the Phantom Rickshaw. This post is inspired by the recent experience of a girl I don't know - a six-year-old homeschooler who was called out for not being in school during school hours, and told, right in front of her father, that that was not right, and she should have someone other than her parents teaching her. The girl was distraught. Don't you get sick of always being with your Mum? You must be stupid since you don't learn anything. Do you homeschool because you have a learning disability? How will you ever get a job? You know people will bully you if you tell them you're unschooled. Of course, this doesn't include the multitude more comments I've received, personally, or which my children probably didn't tell me about, or which I can't remember. They also have been criticized for the clothing they wear, for not believing in God, for our family's painted car, my son for his long hair, for wearing gumboots in the city, for wanting to understand too much about science demonstrations, and even for having allergies (by people who actually told them that allergies don't exist, and fed them food they're allergic to, so that I could deal with the subsequent days of reactions). And on one memorable occasion, as the kids and I were seated in the local bank filling out their forms, together, on the day they got their first savings accounts, we were pulled from our activity by our local police officer. He glared at the three of us, cleared his throat loudly so that we all looked up from our forms, and snapped so that everyone in the bank could hear: "Shouldn't you be in school?" "No." I said, glancing at the clock behind him. "Because my children are unschooled, and because, even if they did go to school, school was out at least 20 minutes ago." My kids grinned at me, the cop apologized, and left with pink cheeks. I later told my kids that if I'd really had my wits about me, I would have reminded him that we do not yet live in a police state, and that even if they did attend school and even if school had been in session, it is my right to pull my kids out without his permission. We went home with a little righteous pleasure, and also a little flustered and grumpy. I shared the story with many people, because I think I needed to feel validated. Am I doing the right thing? This is why criticism hurts - because it digs at our convictions and makes us question them.We all want to feel the arms of our social support system around us, but I think that, although we know these experiences hurt, they also help us grow stronger. We need to question our convictions! We need to re-ask the questions we think we've already answered. Maybe one day it will be right for our kids to go to school, or to try the foods they've avoided for years, or to cut their hair and get a regular job. But meanwhile, one of the greatest lessons my kids are getting from being unschooled is that of diversity. They tread the waters between their schooled, homeschooled, half-schooled, and unschooled friends, of many different ages, interests, and backgrounds, and my kids have the benefit of learning earlier than many others that there is nothing unusual or threatening about this natural diversity. I love that! I also love that in every ignorant question is an opportunity to teach somebody. In journeying down this little-traveled path, we have the privilege of being able to report back from the front; of forging the way for others, and of pulling down some of the hurdles before they get to them. We make mistakes and tell about them, so that others can feel reassured, and maybe both we and they can avoid some of the same pitfalls, later on. That feels really good. When I was a little girl my teacher told my mother that I was "different". That was a death-knell for my self-esteem at the time, but I credit it for my courage, now. It also provided a bit of a cushion between my ego and the incessant threats and teasing I endured. I was put in the Special Needs Enrichment Program (later called the Challenge Program), which as far as I knew meant I just had a big learning problem. People told me I was smart, but all my report cards said I was not working up to my potential. When I was a teenager I actually asked my mother if I was, as we called it then, "mentally retarded". She couldn't understand why on earth I thought that. I have come out of my childhood with a slow-growing understanding that first of all, I am not stupid (this still amazes me), and that I am not even particularly "different". I found my many tribes, and a few close and treasured friends, and that too feels really good. I'm glad to pass this gift of experience on to my children, who are, themselves, different, both from every body else, from each other and from me. So bring on the odd questions, assumptions and prejudices, World! We don't mind answering, and we'll try to do it with compassion, because sharing is wonderful. And of course it sometimes hurts. But luckily it turns out that my kids are not sick of me, and my arms are waiting when the pain of ignorant criticism gets them down. This weekend we took Auntie Julia, Uncle Keith, and the kids' 3 year old cousin, Evan, up the mountain for some early spring snow fun. And yes - it was fun!! There is nothing quite like winter sport for creating that lovely complete rosy-cheeked exhaustion! I took this photo in the low sunlight on the way home from the mountain, today. These hang from the mirror in our car: a dragonfly from my mother and the sun and moon from my brother. They remind me every day to treasure the things I love. And I am blessed with the people and the life I have. I treasure them every single day! These days, Rhiannon would like to be a children's librarian when she grows up. One morning a couple of weeks ago I woke up to this: she was carefully going through her collection, finding duplicate books and determining which, if any, could be given away as gifts or just handed down to those less literarily wealthy. 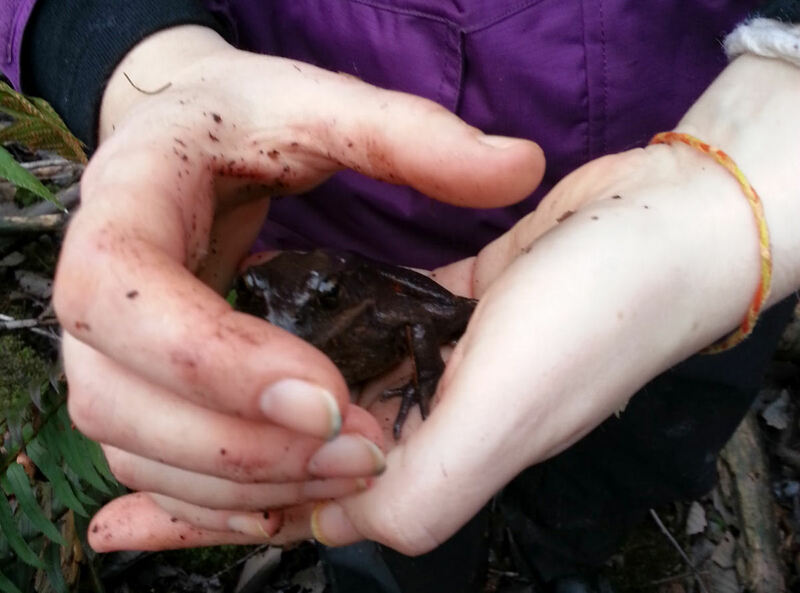 The red-legged frog we found - photo by Michelle Carchrae. The leg bone's connected to the hip bone! Sitting on the upended tree roots. This was a very exciting fireworks show, with "fireworks" made of tiny broken twigs, which the audience is welcome to catch! Every year we celebrate Imbolc, in honour of the early spring, by cleaning out and airing out our house. My mother calls it "Annual Freeze-the-House Day", and the name is rather catching, don't you think? Then when the whole house is refreshed and tidied and scrubbed, and well and thoroughly freezing, and the woodstove even is cleaned and cold... we light it up and eat a hot dinner with lots of milk products to symbolize the new milk of the soon-to-be-birthing ewes. Soon we'll make our now annual visits to our friends' farm and sit with the labouring ewes in hopes of one day catching a lambing. We've never managed to witness one yet, but we keep on trying, and the chilly happy times with good friends spent hanging around in the hay in the barn are among our happiest memories! So this year we had poached pears on walnut-breaded baked mini brie, with a tiny slice of blue cheese in-between. It was rich. I love rich food! I made it up. And I must say I was happy with it!! In the background of this photo you can see my blurry brother Adrian and husband Markus, wrapped up in their winter coats, waiting for the fire to heat us enough, and preparing the kids' exciting grand finale: Star Trek movie!! Young viable Red Legged Frog spawn. NOTE: BEFORE READING THIS, read my more recent post on the issue: Raising Tadpoles: I was wrong. Older Red Legged frog eggs: note the tails on the developing tadpoles. Every spring people ask me how to gather frog eggs from a pond, raise them inside, and release them again, because they know we've done it in the past. So here is finally a public answer that I can just direct people to! Raising frogs is not only fun but also hugely rewarding and, in my opinion, a very good ecology lesson, since it's crucial for the frogs' survival that you observe and replicate their natural environment. mean the introduction of invasive species, causing further decline of the indigenous species and tipping the balance of the whole ecosystem. *If you find stiffer clumps of eggs, more oval-shaped and dense, and often deeper in the water, around sticks or especially lily stems, these are likely eggs of Northwestern Salamander, and are much more difficult to rear successfully. I don't recommend it, and this article is about raising the Red Legged Frogs. observing on site and reporting directly to frogwatch... the program is a joint work between Environment Canada's Ecological Monitoring and Assessment Network and the Canadian Nature Federation. Getting bigger! At this stage some of their internal organs are visible. Start looking at your local still-water pond in early March. Eventually you'll discover frog eggs, if there are any to find, and as you watch them, you'll see that the viable clusters have tiny black dots in the centres. If they're grey or white they may have died; so pick another cluster! If you're a little later, you'll find that the black dots have become clearly definable little black tadpoles, curled up and flicking back and forth in their tiny eggs. Before actually taking the eggs, study the area where you find them, and try to replicate that environment. Frogs lay their eggs in very still water, among plants that will protect and feed the tadpoles, when they hatch. Make sure they have a large enough aquarium with STILL water -- no filter or bubbler, as this will disturb the water & particulate. Usually at least a 20 gallon tank is necessary. Larger is better! Scoop up some of the plants, sticks, and dirt from wherever you collect the frog eggs, and carefully add it to the aquarium. When you put the eggs in the tank, do it carefully, so that they don't fall apart. Try to keep them attached to whatever they were laid on (stick or reed, etc). Water changing isn't a chore because there's so much to discover. You'll need to go back to the water they were laid in to bring fresh water for them, on a regular basis. Partly, this is to make sure the water continues to have enough oxygen for them; partly it's to lower the nitrogen levels (from their poop) and to replace with cleaner water. Bring the water in the house to where you keep your tank, and let it warm up for a few hours to a day, until it's about the same temperature as the tank. Carefully scoop out about 1/2 the tank (more, when they're big tadpoles) one cup at a time, and replace it by slowly pouring one cup at a time into the tank, to refill. Take care not to introduce any big dragonfly larvae or leeches; they'll eat the tadpoles! Or, if you do, (because it's interesting!) take them out before they decimate your stock entirely too much! EGGS: Change water every week or so. TADPOLES: the more they grow, the more often you'll need to change as they eat and poop more. In the end you'll probably have to do some every day, especially if you have a lot of tadpoles. Let some go early!! As they grow it will become more and more difficult to keep up with feeding and water changing, and the healthiest thing to do is to let a few go every week, so that those remaining have more space to thrive. And it's possible that those released earlier have more time to adapt to the wild and live healthier lives in the long run. The baby tadpoles will begin by hanging on and eating their eggs. They're very fragile at this stage, and so are the remaining eggs. Be VERY careful not to disturb them when replacing water. Maybe a good idea to replace less water more often at this stage. Tadpoles eat decomposing plant matter. Find a few different types of pond weeds (they only eat some), especially those with round leaves, and also a boiled lettuce leaf. Watch carefully which types they eat, and find more of those. When they're bigger, you'll be boiling bits of lettuce nearly every day for them, but try not to give them too much at once, or it will make the tank too filthy, and they can suffocate. At first they'll hang on things by sucking on with their mouths, but once they develop legs they like to use them, so make sure there are some sticks properly wedged in (not just floating), so that they can climb around on them. Once they get forelegs they begin to come out of the water, and will need a branch that sticks out. Once their tails begin to shrink, they'll start jumping, and that's time to let them go, before they jump out of the tank and die in the house. Don't wait too long after they begin to develop forelegs; the jumping happens faster than you think! Take them to where you originally found them, and slowly (every few minutes) add cups of the water to their container, until they are accustomed to the new temperature. Don't rush it! This should take a loooong time. If you can, it's even better to slowly acclimatize them by moving their tank to a cooler location every day (but never in the sun!) until it's outside on the last day, at which point you go to the pond and start adding cups of water as above. Bid your friends farewell, and wish them a happy life! Be careful not to drive over them when they migrate across the road, later in the year! The following are the most common problems I've seen, which generally mean the tadpoles die and the whole project fails. Avoid them! The aquarium is too small for the amount of eggs or tadpoles. I would estimate that you don't want the clump of eggs to take up more than about 1/10th of the volume of the tank. The real reason this is a problem is because you cannot safely exchange enough of the water, often enough, to keep them well-supplied with oxygen and clean water. The aquarium is in the sun or near some heat source, and the water gets too warm. The water gets contaminated by kids' enthusiastic activities! Leeches, dragonfly larvae or other predators are introduced with the setup or exchanges, and they devour the tadpoles! Mind you, this is interesting to observe, and definitely helps recreate the real-life scenario they'd be living with in the wild!